This past week celebrated Wilfrid Laurier University’s caring spirit with a number of activities across the university’s campuses. Current students, staff, faculty, alumni and local neighbours celebrated Laurier’s community focus through a variety of events. 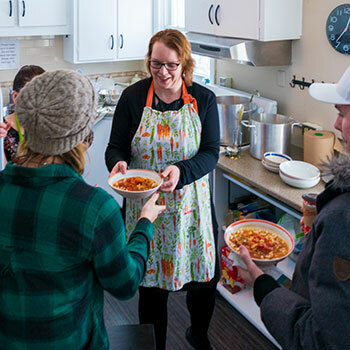 While caring is in Laurier’s DNA and part of the university’s activities year-round, Laurier Cares was an opportunity to thank the Laurier and local communities and those that give back. Laurier students spreading Random Acts of Kindness all day on Feb. 15. For more than 20 years, Laurier staff, faculty and retirees have worked together to support the communities in which we reside through Brant United Way, and United Way Waterloo Region Communities. In 2017, we surpassed our fundraising goal for the second year in row. The official campaign runs throughout October each year, with many events and ways to get involved, but contributions are welcome any time throughout the year. Laurier faculty and staff are invited to volunteer at events, or on the campaign executive committees. Contact Adrianna Crusoe (Waterloo campaign) or Beth Sanders (Brantford campaign) at unitedway@wlu.ca. Laurier is part of Canadian Blood Service’s Partners for Life program, for which the university commits to an annual blood pledge. Twice a year Laurier offers on-campus blood drives for the Laurier community, but Laurier faculty, staff, students and alumni can have their next donation count toward Laurier’s pledge. Ask at the reception desk during your next blood donation appointment to have it count towards Laurier’s pledge, or register online with Laurier by using our Partner ID: WILF001529. For more information about Laurier’s community initiatives, visit wlu.ca/community or email community@wlu.ca. A testament to the unique nature of our Laurier community is our strong culture of giving back, which includes Laurier’s internal fundraising campaign: the Community Campaign. You can be the catalyst for our university and Laurier students by making a donation today. Join hundreds of your fellow colleagues by setting up your payroll contributions today at laurieralumni.ca/communitycampaign. Visit Laurier’s crowdfunding platform HAWKstarter.com to learn about and donate to unique initiatives led by students, staff and faculty. To help the projects reach their goals, please also consider sharing news of Laurier’s platform with your networks. Around the world, Laurier alumni will band together on Saturday, April 21, 2018 to give back and inspire others in their hometowns. Join fellow #HelpingHawks who are all volunteering on the same day! For more information or to register, visit laurieralumni.ca/events.